Last Saturday I joined a group of students from uni aboard the Free Spirit to carry out a series of surveys in the Fal Estuary, sifting through the water column to assess the level of microplastics polluting this rich ecosystem. the team for the day’s survey: a mix of undergrad and masters students from biology courses at the University of Exeter’s Penryn campus. A brave bunch for enduring the freezing conditions! The River Fal (or Dowr Fala in Cornish) forms an extensive network of creeks, rivers and estuarine habitats covering a surprisingly large area. Bubbling up from the hills of Goss Mor in the north,the mouth of this river enters the English channel beside Falmouth in the west, after passing through a diverse range of habitats along the way. Muddy river creeks and drowned river valleys are lined with rich sessile oak woodland; willow and alder carr abounding in the damper areas. The result of this tapestry of habitats is an amazing diversity of wildlife, which is always brilliant to encounter on our regular trips up the estuary aboard AK Wildlife Cruises‘ Free Spirit. Today, though, the focus of our trip was different. Whilst we were noting down the diversity of winter wildlife we did encounter, our primary focus was to carry out standardised microplastic surveys as part of a new initiative to gain some baseline data on this worrying form of pollution. We sped through the Carrick Roads and into the shelter of the Roseland Peninsula, scanning the river mouth for the divers, grebes and mergansers that rely heavily on this area for overwintering habitat. We enjoyed some great views of Black-necked and Slavonian Grebes bobbing in the water, which we duly noted down and marked in the GPS database as part of the long-term monitoring carried out by AK Wildlife Cruises. The tide was at it’s peak mid-morning, so we made haste to make it to the farthest reaches of the river before these creeks dried out with the ebbing tide. We were treated to fantastic views of grey seals, a surprising herd of some 60 fallow deer in the neighbouring Trelissick estate, and an abundance of estuarine birds such as little egrets, grey herons, greenshanks, shellducks and curlews. It was especially enjoyable to hear the burbling call of curlews echoing out across the mudflats…a call definitely secured as an all-time favourite for me! We reached the inland limit of where we could get to without grounding into the mudflats, and so turned 180′ and headed to our first sampling location: where rivers from the Fal and Truro meet. We all jumped into action to get our first survey underway: two plankton nets, made of fine mesh and cone-shaped, were deployed on our Port and Starboard sides. We eased out about 20 metres of rope before tying the nets off, and then slowly towed these through the water for 15 minutes. GPS coordinates of our location were scribbled down on the datasheets, allowing us to return to this site in the future to carry out another survey as a comparison. After 15 minutes, we hauled in the nets (bitterly cold on the hands for the unfortunate ones on rope duty!) and examined the result of our first survey: emptying the contents of a small collection pot at the end of the net into our sampling pots for closer inspection. What could we see? Well, fairly brown-looking water with a lot of silt and not much else! But we allowed the sediment to settle before having a closer look, and could spot a few insidious interlopers that were definitely not of natural origin: bright little fragments of plastic and even smaller polyester microfibres. 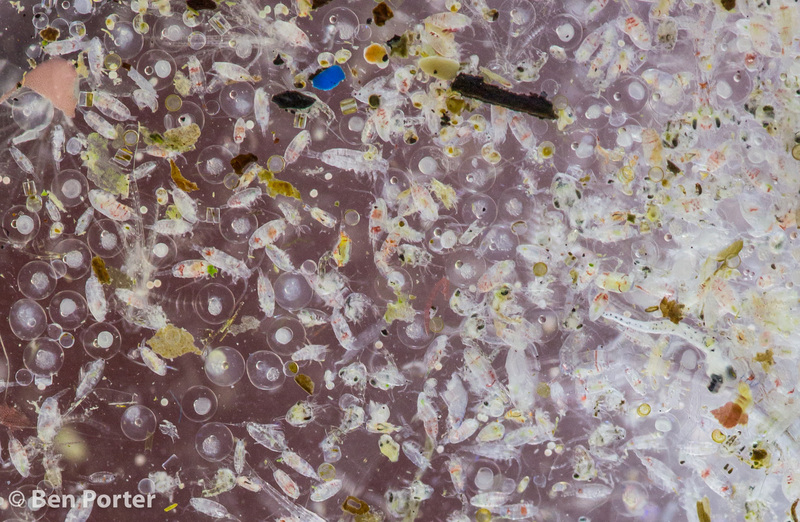 a close-up of the debris in some of our first samples: in amongst the tiny planktonic organisms you can see a few large fragments of microplastics, and closer scrutiny reveals an abundance of minuscule ‘microfibres’…what appear to be these worryingly ubiquitous pollutants that origniate from synthetic fibres washing off clothing. We chugged our way slowly out of the river system and out towards the open sea, carrying out three more surveys along the way: one in the entrance to the River Fal in the Carrick Roads; one off St Mawes and the Roseland heritage coast, and another as we entered back into Falmouth Docks. The most surprising finding in the samples here was the sheer abundance of zooplankton! Each sample was brimming with a seething mass of these tiny organisms that form the base of the food web supporting many rich marine ecosystems. We could again see evidence of microfibres and microplastics in amongst them, but without specialist equipment it was hard to quantify their abundance. I’m not incredibly adept at my micro-ID of zooplankton, but I believe we have a diverse mix of fish larvae and eggs, copepods, crab larvae and much more. Any input would be much appreciated! It was very interesting to carry out the first of our microplastic surveys, revealing what invisible pollutants may be lurking in the waters around our precious coastline here in Cornwall. We hope to analyse these samples back in the lab, shedding light on the exact amount and nature of the plastic pollutants we discovered. Fingers crossed the easterly winds will ease off enough in the next couple of weeks to allow us to head back out and sample some sites offshore…watch this space! Many thanks to AK Wildlife Cruises for agreeing to collaborate with the university and several of the campus societies such as EcoSoc and Student Seaquest to carry out these surveys. My name is Ola, and I help to write the blog at Thompson and Morgan, the seed company. We’re doing a special feature about wildlife blogs and came across yours. We particularly enjoyed your article about the surveys you carried out in the Fal Estuary. If it’s OK with you, we’d like to include your blog in our piece. The Thompson & Morgan blog attracts a large readership and you’ll be featured alongside some top bloggers, all of whom write with style and authority. We’re hoping to publish the post soon; would it be alright if we use a picture to accompany the write-up of your blog? It goes without saying that we’ll credit and link, both the photo and our review of your blog, to your page, and I’ll be sure to let you know when we make this piece live. Should you have any queries, please do let me know – I’ll be happy to help. Thanks for the comment, and I’m glad you and the company you work for enjoyed some of my blog posts. I am happy for you to mention and include those blog pieces in your article sure! And as you say including a link to my main photography website (www.benporterwildlife.co.uk) and credits would be great. What would the article be focussing on? It would be interesting to see the article once it’s finished, and if it is published on Facebook at all then tagging my page (https://www.facebook.com/benporterwildimages/) would be much appreciated too.